I seem to go in movie watching phases around here. I'll watch a few and then take a break from them for months on end. My last round of movies were watched at the tail end of pregnancy and after you've sat around for so many months, the last thing you really want to do is sit in front of a screen for an extended period of time. * Beyond that, when you have three kids you don't really have time to park yourself in front of a screen for a long while. So when I choose to watch a movie, I'm looking for something that I think I'll enjoy and will be good. If you are unfamiliar with the movie, it is based on the true story of racehorse, Secretariat. Secretariat was "the greatest racehorse of all time" having won the Triple Crown in 1973. The movie follows the story of his owner, Penny Chenery, who inherited him along with her father's stables. You might say that horses were in Penny's blood, long after she married and moved away from her father's horse farm and stables. Upon her father's death, after Penny herself has been married for 18 years (and is the mother of 4 children), she takes over the stables and begins to promote Secretariat. In the movie, very few people believe in this horse's ability to win anything - excepting Penny and the trainer she hires. On screen and in real life Penny garnered a lot of attention, most notably for being female and being involved in the world of racing. In 1983, she and two other women (Martha F. Gerry and Allaire du Pont) became the first female members to be admitted into The Jockey Club. She captured media attention and, at least according to the movie, got a lot of flak for coming onto the racing scene as a housewife. In fact, the movie focuses heavily on the idea that Penny was a housewife trying to break into the world of men and do something that no woman had ever done before. When it appeared as if her father's horse stables were in such financial distress that it would behoove the family to sell, Penny is chided both by her brother and her husband for fighting so hard to save the family's horses. 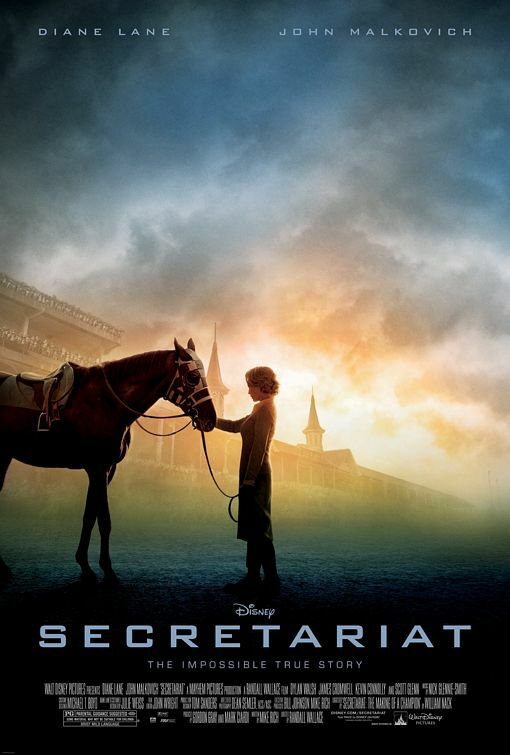 Penny has to make a critical choice in the film whether to go back home to her husband and children and be a wife and mother, or to split up her time and give a good deal of her attention to Secretariat. I think it would be obvious what choice she made, given the fact that there is a movie in existence to celebrate it. At first, Penny's husband is not in support of her devoting her life's attention to Secretariat. He wants her home with him and their four children (age 16 and under in the film.) Her oldest daughter is living life in the 1960's and is participating in anti-war efforts and finish up her high school years. Her youngest are in elementary school. Although Penny does try to keep up with her family by making regular phone calls home, anyone knows that while the phone is a useful tool, it doesn't replace the person's actual presence in your midst. There is one point in the movie where Penny is trying to fly home in order to make it to her daughter's high school play but her flight is canceled. We see Penny sobbing on the bed because she wants to be with her family but circumstances have prevented her from being. Although we never see her address her absence directly with her daughter, we are with her in the hotel room as she cries herself to sleep that night. On the whole, I would say that the point of Secretariat is to make you realize what a completely amazing animal Secretariat was and how blessed he was to have a person believe in him and his abilities as much as Penny Chenery Tweedy. You're supposed to reflect on the greatness of the horse and of all the boundaries that Penny crashed through in her attempts to see Secretariat run to victory. In the end, even her husband tells Penny that she is an inspiration. Her oldest daughter tells her how proud she is of having her for a mother and how much she has taught her about what it means to be a woman. Penny is happy. The horse is a champion. They've won their races. In short, while I thought this film was interesting (for discussion sake) I was ultimately disappointed in Penny's choice because it was one that she wasn't being forced to make (i.e., her family didn't need the income from the horse.) She decided to stick it out with Secretariat for the love of horses, her father, and the stables. These things looked to outrank her husband, children and family life as a result. I can totally understand appreciating and enjoying a diversion from the home every now and again (on a regular basis!) I confess that I cannot understand making the choice to be away from my family for weeks and months at a time for the sake of pursuing outside interests. My top interest right now is by nature my husband, my children, my home. I don't wish to sacrifice that and I think sacrifice is most definitely required to do what Penny did. In my opinion, it wasn't the best choice. My children will not be in my home forever. In the great span of life, they'll be away from me before I can even realize it even in this potty training, diapering moment. Home life is most certainly not easy and yes, I'd be lying if I said that I don't wish for "freedom" from time to time (as it would relate to a good night's sleep or the ability to run errands without using the phrase, "one hand on the cart!" one hundred million times.) I would also be lying to you if I said I wanted to trade what one friend called this 'beautiful mess' for all the books, horses, vacations, meals-out-wherein-I-am-allowed-to-use-my-own-fork-for-the-entirety-of-the-meal, for anything in the world. Home is where it's at, folks. I'm investing in what I care about - with my time, care and love. Mothering can't be beat either. And the win? Much, much more satisfying. * Not to make it sound like we never watch anything. Jonathan and I prefer to spend any "wind down" time in front of the computer screen, with Hulu, watching Castle or White Collar. I totally agree with you on all of those points, it made the movie hard to watch for me. Great review! My sentiments exactly! Having some definite horse-lovers here, we enjoyed watching a decent "horse movie." I've not heard many people bring out these same concerns when they talk about the movie. But they were prime issues of discussion in our home afterward! She did make choices that had consequences in her marriage and family and I would be surprised if "everything turned out okay in the end." I am so glad to hear you articulate some of my same thoughts! I was beginning to wonder if I was the only one who didn't just love the movie. I liked it okay, but I too was so disappointed in its portrayal of the role of wife and mom, a secondary role at best. I grow so weary of the insistence of the seeming rightness of laying aside these primary callings in order to do something "great." I fully agree with you and the comments left! I was looking forward to a great horse movie, and while it was interesting and pretty to look at, I was really upset with the mother abandoning her children. That's essentially what she was doing, putting her horse ahead of her family. As someone who is home with her husband and wants children more than anything, I just can't understand her choice. And that ruined the movie for me. I haven't seen the movie, but I agree that we need to sacrifice to invest time in our families rather than sacrificing them to invest time elsewhere. It's sad that society lauds the sacrifice of family for other pursuits. I saw this movie on Netflicks but never watched. It just didn't appeal to me. I've concluded that no amount of "personal satisfaction" or monetary gain is worth missing moments with my children. Sounds like this movie tells the story of yet another woman who missed out on the truly important things of life.